It is the most difficult and interesting crm certification i have come across. i am going to give you some tips and sample questions that you can expect. 1.Your Dynamics CRM organization uses Microsoft Yammer. 3.You have a recalled product that should no longer be sold. 4.You have an existing customer named customer1. the marketing team can report on the return on investment (ROl) of the initiative. creates a record that has a currency field? 7.You company employs consultants who bill customers for their time. 8.Your company plans to deploy Dynamics CRM. 9.Your company has a Dynamics CRM organization. you can write to me @ rawish_kumar93@hotmail.com if you need any support. I had a strange issue in production ,so whenever we were doing a deployment ( reference data +solution). After the deployment the mailbox settings incoming email and outgoing is getting set to “None” rather then “Server – side synchronous or email router”. After performing multiple steps/deployments; I found the solution to this issue. I use migration utility tool to export and import the reference data. I removed these two properties and I could see it was excluded from the mailbox update. moral of the story : queue will have so many fields dedicated for its mailbox. we have to make sure what will update what. Dynamic marketing lists is able to save time and ensured that everyone that should be on the list was on the list. A Static marketing list is a snapshot in time. You add the contacts you want in that marketing list depending on certain criteria…and that was it. If a new contact is added to the CRM database you can manually add them to the marketing list, or if the marketing list is no longer relevant to a contact you can manually remove them. Dynamic marketing lists removes the manual element. You can create a query (e.g. all customers where their country equals Ireland). This means that any contacts with “Country = Ireland” will be added to the list. As you add new contacts to the CRM database, they will automatically be added to the marketing list if they live in Ireland. If a contact moves and the Country field in the contact card is updated, then they will be automatically removed from the marketing list. Blocked attribute You cannot block a dynamic list (you can use the copy to static button to copy the members of a dynamic list to a new static marketing list) You can block a static list, which stops members being added or deleted. Updating list members automatic Manual – a static list has to be updated manually. Hi Guys, I have recently passed MB2-716 ; hence thought putting some sample questions and tips on the this exam. You are implementing a Lead to Quote business process. The process will update the Lead. Account Contact, and Quote entities. You need to create a business process flow (BPF) that spans the entities. For each stage, specify the step. You can use entities that have N:N relationships. BPF can have 1: N Relationship, we can add same entity in different stages. Relationship is recommended between entities but can be set as None. The business rule must nin when you import account records. Which two conditions must be true? Each correct answer presents a complete solution. The scope was set to Entity. You are implementing a new business process. The system must send a notification to the manager 24 hours after an opportunity Is created based on the date of the next best action. Which type of workflow should you implement? You create a business rule for the Case entity and set the scope to Case (form). Which action will cause the business rule to run? You are a subject matter expert for an insurance company. You have a complex business method that is used for settling and releasing claims. You need to create a process in Microsoft Dynamics 365 to assist team members with the claims settlement process. You must limit this process to team members that have a specific security role. please leave a comment or mail me at rawish_kumar93@hotmail.com for any question. Identify which entity caused the failure. For example, from the screenshot above we can see the failure comes from the particular entity. Re-export the solution and import again. Users Sometimes experience an error while opening a contact/any entity. Its an intermittent error and not reproducible all the time and for all users. I created a solution, added the contact entity with forms and exported the solution. Opened the customization XML and found below. The error has to do with InternalHandlers that is calling a library and a function form_onload which is somehow attached to this event Hence I had commented out the below InternalHandler property. Saved the customization.xml file and zipped the solution; imported back to CRM. During my Career in CRM dynamics, I have struggled a lot when it comes to seeing what is going out of CRM so that it can be used to investigate things. Especially the people who involve in a lot of triaging of issues & developing integration plugins and needs to validate it. WSDL of the target service. Up and running server where you have SOAP UI installed. Browse to the WSDL and click okay. once you do that it will give you the list of operations and the path of the mock service. Now you might have to modify the response you are getting from mock service to do that double click on the service (e.g here “buy”) than on the response add whataver you need. close the box. click on the green button to run this service. now in order for your CRM to reach to this service you have to configure this end point. either in your config file or if you read it from a custom entity in CRM. now the endpoint would be the combination of your server address for.e.g. you can get the mock service Path from the custom properties box on the left bottom.side. double click on that than on the option format XML to see the XML you need. you are not able to create queues. you are not able to create mailboxes. In short, all confidential stuff in CRM where you require a user name or password it will be disabled if you have encryption disabled. 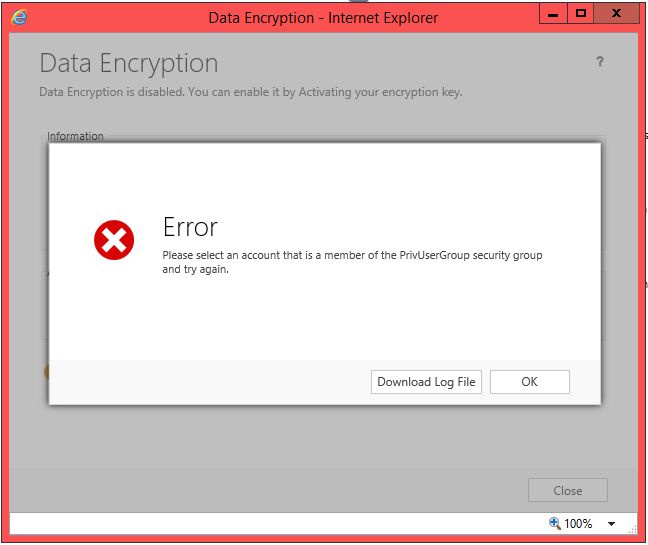 According to the error, to enable encryption we need to go into Data Encryption under Data Management. 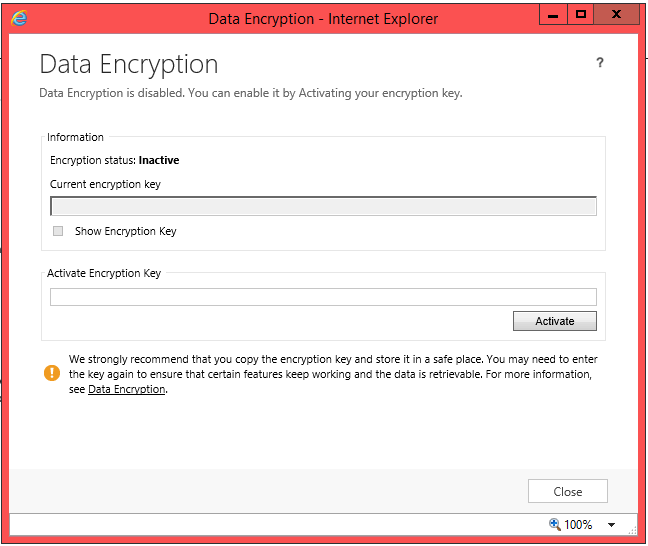 However, we can only enable Data Encryption if Dynamics CRM is using the https protocol, and usually, the reason we’ve done a backup/restore is that we’re setting up a Dev or UAT copy of Prod, which may not need to be https. This error states that “The HTTPS protocol is required for this type of request. Enable the HTTPS protocol and try again.” However, enabling https may not be ideal, and we still need to be able to use the system. You shouldn’t do this on a production instance, but for Dev or UAT instances this is necessary. Once that’s updated you need to do an IISRESET on the CRM server for the changes to take effect. If we try opening that Data Encryption window again, we should see that encryption is disabled, and we can create a new key and activate it. You should be able to get the encryption key from the original CRM system you backed up from. If not, then you can simply create a new encryption key. A simple solution to this issue would be to use an account with which the CRM instance is installed or add this user to the security group mentioned in the error. In this blog i am going to show you , how you can retrieve a lookup value from other entity in CRM 2016 using web api and set it on the form. we know how its done in Odata but its time for some Web API action. var newid = lookup.id.slice(1, -1);  // you will get perfect id like "EDCJDKDJDKJDJDKJDJKD" here. var req = new XMLHttpRequest(); //once you have the id , you have frame to make a webapi GET call by proving the newid we got. var result = JSON.parse(this.response); // you will get the retrieved value in object we stored in result var. you can call this function on change of the field. In this blog i am going to show how you can retrieve a lookup value and set it. for e.g if you need to set one contact which in a regarding field on an activity to another contact field. Call this function on Onload of the required form.